Advantage Rent A Car's mission is to help you get there quickly, efficiently and pleasantly. Wherever you're going you can count on Advantage Rent A Car. Get a new or next-to-new vehicle that's ready when you are. 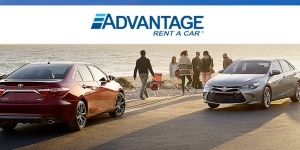 Advantage Rent A Car is one of the largest car rental companies in the United States and caters to business and leisure travelers with convenient locations in 44 of the nation's top travel markets.